Humorous insight on sniffing faces and butts - more than a social greeting and dominant rank display, dogs can detect cancer and other disease in humans. We are just beginning to understand dogs. It only took us a thousand years to learn what they are capable of doing for mankind. What dogs do for our wounded warriors, in both mind and body, is nothing short of Godly. Some of you know I have a PhD in Comparative Religion so I don't say that lightly. I just wonder why it took us so long to "discover" what dogs can do and why they sniff people. I want to tell you a little story that is a perfect example. I had a Doberman Pinscher, my soul dog. My pup was about 14 months old when we were asked to entertain a very important government official for dinner and cocktails. Now you have to understand, at this time we were living in a foreign country. Customs were very different in this country and it was a dress up affair, the ladies wearing long dresses and the men in black tie. As was the custom, when their car arrived at our gate, the guard let them in and notified us that our guests were arriving. My husband and I went to the foyer to greet them and of course our beloved dog was right behind us. As I reached out to shake hands with the gentleman, my dog pushed forward and placed her nose very directly in his crotch. Now I don't mean that she went up to him to take a lady-like sniff. Nope, not my girl. She was intent on keeping her nose buried in his groin, snuffling loudly. As discretely as possible, I made her get back. We tried to laugh about it but we were very embarrassed. Now these many years later, as I learn more about dogs sniffing out cancer and other human diseases, I wonder what became of that dignitary. Dogs have us beat in every respect. Actually the only thing that we have that they don't, is that we walk upright on two legs, and we have an opposing digit. The thumb! Their eyesight is better than ours, dogs certainly can hear many times better than we can, they can smell 1000 times better than humans, and dogs are so much faster than we are it is laughable. Pound for pound, dogs are much stronger than people. Just think about it. They best us at every turn, and yet we are the masters who expect them to fit into our world. Sniffing is more than a social greeting. 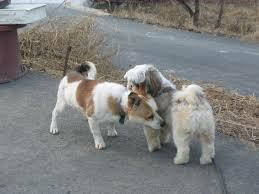 Through the sniff check, dogs can determine the social status, character, and overall health. One of my students said if we had the same sense of smell, we'd be sniffing bottoms too. Well, I wouldn't go that far, but we sure would know a lot more about the people whom we meet. In fact, who would need the CIA? Dogs detect drugs and explosives and finally, doctors now know that some dogs can, and will indicate a cancer spot in humans. Just pals will sniff each other's faces, heads, neck and ears, it is a hello thing. Equal ranking gives you the right to smell each others bottoms at the same time. However, if not equal on the social ladder, the lower ranking dog will stand very still (or lie down) and allow the higher ranked dog to sniff under the tail. What determines a dog's ranking and how do they know? My dog hasn't told me yet.. Ever wonder why, especially when you are in a hurry, you dog will take forever to sniff every blade of grass, and every tree trunk within ten miles? There you stand freezing or about to be drenched and your dog is smelling. It is his favorite program. He doesn't need to watch TV! Checking scent from the feces and urine, your dog can tell exactly what has transpired in his territory. It will also tell your dog if he is in someone else's territory, or if that good looking gal down the street is getting romantic! If it is you that is the sniffee, then move forward somewhat aggressively. Now I don't mean in a threatening way, but step right on up there to the dog, if you are a trainer and/or well-coordinated you might bump his toes with your shoe. If this is an unstoppable dog, and there are those, believe me, and that doesn't work, then it is better to let the dog sniff and be done with it. If you don't they will just keep trying. Hey, this is important-to-know stuff, for the dog. If you are the owner of the dog and you are not quite that much into the natural, give him a subtle leash correction or if that doesn't work, say firmly, "NO sniff (dogs name)!" It's just a matter of training and timing because he cannot fathom why you don't want him to do that any more than a guest could understand if instead of saying "hello" you turned your back and ignored them. That embarrassed little laugh of yours won't do it. You will have to be firm here, because you are asking your dog to go against one of the most basic instincts he has for survival in the pack. Now if it is YOUR dog that is being sniffed and he lays down and especially if he lifts his leg exposing his groin, he is showing total submission. Do nothing to encourage your dog to get up!!!! You could prompt an attack by the dominant dog. Let him be submissive while the other dog sniffs. Even a mean, aggressive dog will not hurt a totally submissive dog. Oh, wait, before you go to learn about other dog language and the embarrassing things they do in front of company, take a minute and have a good laugh about this classic piece of poetry called The Romance Of Rex. It's a tale of a "pedigreed piddlin' pup in ten piddles and a puddle." Then you can come right back for more insight into important stuff.